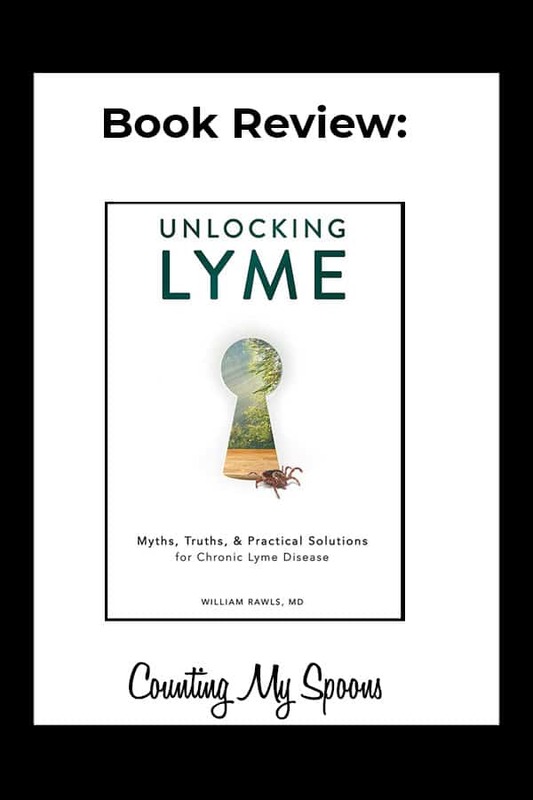 I was offered a free copy of Dr. Bill Rawls‘ new book: Unlocking Lyme: Myths, Truths, and Practical Solutions for Beating Lyme Disease in exchange for an honest review on my blog. A couple of years back I reviewed Dr. Rawls’ earlier book – Suffered Long Enough, which covers his journey with Lyme/Fibro/CFSME. Dr. Rawls is an actual medical doctor who also happens to suffer from these illnesses. He lumps the three together as one and strongly believes they are connected. Given the number of people I know who initially are labeled as one and then later get diagnosed with another I strongly believe it as well. The testing for Lyme is still very questionable with many false negatives, and most tests not testing for every strain of the bacteria that can cause Lyme. After having to give up his medical practice because he couldn’t keep up through the fatigue and pain, Dr. Rawls searched medical literature for an answer and through trial and error (and self-testing) he created his Vital Plan protocol for the treatment of Lyme/ Fibromyalgia/ CFSME. Vital Plan Restore is a natural treatment protocol that involves a high amount of supplementation as well as diet and lifestyle changes. His diet and lifestyle change recommendations are along the same line as those I’ve already made. Unlocking Lyme starts off by explaining what Lyme disease is and what causes it. Most importantly that it’s not just one bacteria – Borrelia burgdorferi but a number of bacteria that can cause Lyme disease. How when this disease was originally labeled in 1975 the medical community thought it was a new disease but evidence has since shown this disease is prehistoric. He explains that we all likely carry low levels of this bacteria but most of us don’t react to it. Unfortunately, other elements can cause an increased reaction to the bacteria and that’s when we see acute or chronic Lyme infections. The history of this illness is really interesting and starting with that definitely sucked me right into this book. Thankfully, however, Dr. Rawls didn’t stop with history. He goes on to explain what happens when you are bitten by a tick, how Lyme is transferred and how different people are affected by the infection in different ways. Those of us with healthy immune systems can fight off a Lyme infection because our bodies have already been introduced to the bacteria and know what to do with it. Unfortunately, we don’t all have perfectly healthy immune systems and that’s where the problem begins. Dr. Rawls explains the stages of Lyme disease and the difference between acute and chronic Lyme infections. He also explains the various other illnesses that can be transmitted through tick bites as well as other infections that mimic or have very similar symptoms to Lyme. One of the most interesting things that Dr. Rawls explains is the virulence pyramid. The less experience a body has with a particular infection the more damage it can do. For example, we encounter the cold virus regularly so it has very low virulence (it might make us sick for a few days but causes no real damage). Whereas something like Ebola your body has zero experience with and therefore it has high virulence (it’ll probably kill you). At this point the book takes a turn into an area that we can all benefit from. While his focus is on chronic lyme infection, he could just as well have labeled it chronic illness because the info applies. He discusses how the various stressors in our life cause a virtual “pot boiling over” effect. This results in a situation where low virulence infections that the body should ignore (like Lyme) suddenly become something that the body can’t ignore. An infection that should be suppressed instead takes over. It’s not just Lyme. Dr. Rawls explains that these same issues apply to viruses like CMV or Epstein Barr (often believed to be at the root of Fibro and/or CFSME). He explains the seven categories of system disrupters and how in order to heal we have to reverse those disruptors (things like eating unnatural foods and toxin overload). He covers the various Lyme tests and the history of diagnosing Lyme disease, only to eventually say that when you choose the right treatment it really doesn’t matter if you have a specific diagnosis. It’s all about removing the system disruptors and healing the body from the inside out. His approach is through cleaning up the environment you live in (what you put in, on, and near your body) as well as putting in better foods and supplementing with herbs that will heal. The advantage of herbs he points out is that risk of side effects is low and the amount your body can tolerate is high. He spends time discussing different classes of herbs and why each is important for healing Lyme. I especially appreciated that in this book he included many citations to medical studies for the various herbs. Dr. Rawls also explained what each has been found to help and the potential side effects. I found this helpful as there were a few that I would have considered until I read that they can be over-stimulating and should probably be avoided by those with anxiety or insomnia. Whereas there were other herbs that I knew I wanted to add to my diet because of the potential for improvements to existing symptoms as well as the likelihood that they will fight infections like CMV and Epstein Barr (both of which I am actively or chronically infected with). Overall, I found this book much more enjoyable than Suffered Long Enough. While I enjoyed that book, I found that he spent a lot of time reiterating the different herbs and supplements. Wheras this book spent a lot more time on explaining what Lyme is and how it works in the body, while also making sure to adequately cover the herbs and treatment protocol. Unlocking Lyme delves into the science behind Lyme disease, explaining what it is, but more importantly how it can be overcome. 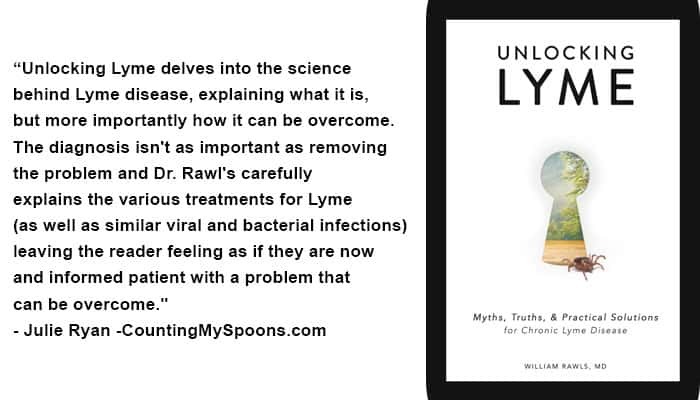 The diagnosis isn’t as important as removing the problem and Dr. Rawl’s carefully explains the various treatments for Lyme (as well as similar viral and bacterial infections) leaving the reader feeling as if they are now and informed patient with a problem that can be overcome. I was diagnosed a year and a half ago with Lyme disease after three months of flu-like symptoms and severe knee and foot pain. Finally, after several tests and an expensive MRI, I was diagnosed. I was put on doxycycline and had a severe reaction to that, so then they put me on a different medication. My pain still didn’t go away for good. I still had bouts of pain and fatigue that last weeks. I was seeking something to help regain my life to be able to do things for myself. Through my primary physician i learnt about a Lyme disease herbal formula from NATURAL HERBAL GARDENS and their success rate with the treatment, i immediately started on the Lyme disease herbal protocol, I am glad to report the herbal formula worked effectively and there was no side effects, I had a total decline in symptoms, the pains, chronic fatigue and other symptoms stopped, my Lyme disease is totally REVERSED.